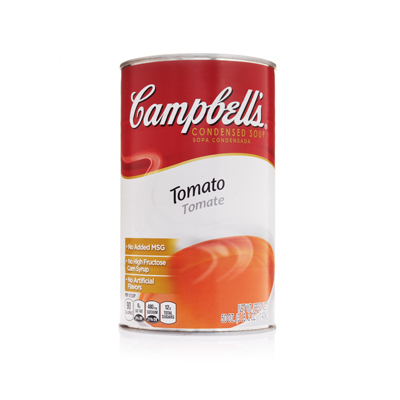 Try our Thai Tomato Noodles with Chicken made with Campbell's® Condensed Tomato Soup. Soy sauce, sweet and sour sauce, and red chili paste give this dish the Thai flavors you and your patrons will love at a cost of under $1 per serving! onion	 2 lb. 1 qt. 1. Heat oil over medium heat. Add onions, green and red peppers, and garlic. Sauté for about 5 minutes until vegetables are soft and onions are translucent. CCP: Cover and hold at 140 °F or higher. 2. Whisk condensed soup, water, sweet and soursauce, low sodium soy sauce, and Thai roasted red chili paste together until well blended. unseasoned chicken strips, cooked, frozen	 125 oz. cooked whole grain spaghetti, broken in half	 8 lb. 3. 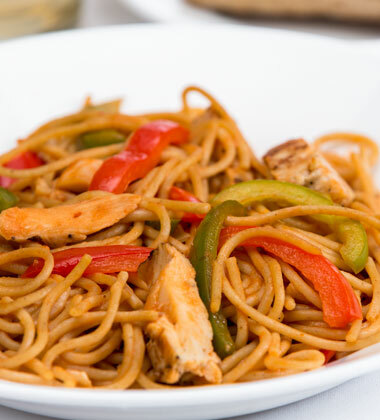 Combine cooked vegetables, sauce, chicken,and cooked spaghetti together. Stir gently until all ingredients are well coated with the sauce and evenly distributed. CCP: Heat in a 350 °F until the mixture reaches165° F for at least 15 seconds. 6. Remove from oven. Toss the mixture usinglarge kitchen spoons or tongs. CCP: Cover and hold for hot service at 140 °F. 7. To serve portion 1 ½ cups onto plate (two 6 oz spoodles). onion	 1.625 lb. 1 qt. cooked whole grain spaghetti	 7.688 lb. 1.8 oz chicken fajita strips provides 1 oz equivalent meat/meat alternate. If pasta is prepared in advance of the day of service, follow directions for cooking pasta for same day service. After cooked and drained, return the pasta to the vessel and cover it with cold water. Add ice, stir gently, and chill the pasta to 40 degrees F or below. Skim off any remaining ice with a strainer, and drain. Store in covered containers, refrigerated at 40 degrees F. To reheat, place pasta in a basket or strainer and plunge into rapidly boiling water. Drain hold for service at 140 degrees; F or higher. Breaking spaghetti in half will make it easier to portion with a spoodle Recipe variation: Substitute unseasoned cooked enriched ramen noodles for the whole grain spaghetti. To make this recipe for 50 portions, use 4 lb raw noodles. To make this recipe for 100 portions, use 8 lb ramen noodles. This amount of ramen noodles will contribute 1 oz equivalent grain per serving.